5-HTP ER has a delivery system that releases 5-HTP (5 Hydroxy tryptophan, 5htp) slowly and steadily over a period of time. 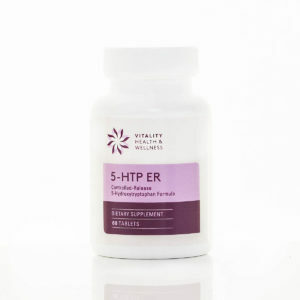 5-HTP is a drug-free amino acid delivered from a plant naturally increases the body’s level of serotonin, the chemical messenger that affects emotions, behavior, appetite, and sleep. today’s stressed-filled lifestyles and dietary practices may negatively affect how the body handles serotonin. 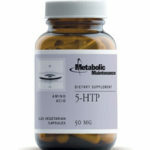 Regular use of 5-HTP ER helps promote a more positive outlook and greater appetite control. Directions: Take one tablet, up to two times daily, with a meal. Do not exceed recommended dose. 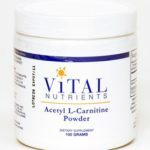 Caution: Do not use with other dietary supplements containing L-tryptophan, 5-HTP, St. John’s wort, SAME, or Hawaiian baby wood rose. 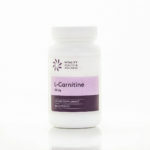 Do not take if you are, or suspect you are pregnant or if you are lactating, or under 18 years of age. DOES NOT CONTAIN: Wheat, gluten, corn, yeast, soy, animal or dairy products, fish, shell fish, tree nuts, egg, artificial flavors, artificial sweeteners , or preservatives. 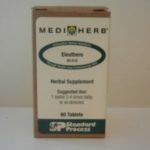 Be the first to review “5-HTP ER 60 Tablets” Click here to cancel reply.